Well, this is my third month of Sample Society, and I am at a loss with whether I should cancel. This month's box was just ok. Nothing exceptional. However, it included one product that I have wanted to try. The first month I used one product that I still use today (bought the full size). Last month's products have not even been used yet . . . so torn. Strivectin-SDIntensive Concentrate for stretch marks and wrinkles- .75 oz (5 oz is $135) . . . in theory that would make this little tube worth, $25???? I honestly do not like Sti-Vectin and do not see how anyone would pay so much when there are much better products out there. They must have one heck of a marketing budget with all of these free samples everywhere! Stila Forever Your Curl Mascara- .12 oz (seems small, but a .24 ounce sells for $22. I have used these small tubes in the past and can usually have them last 1-2 months.) Value of perhaps $11? 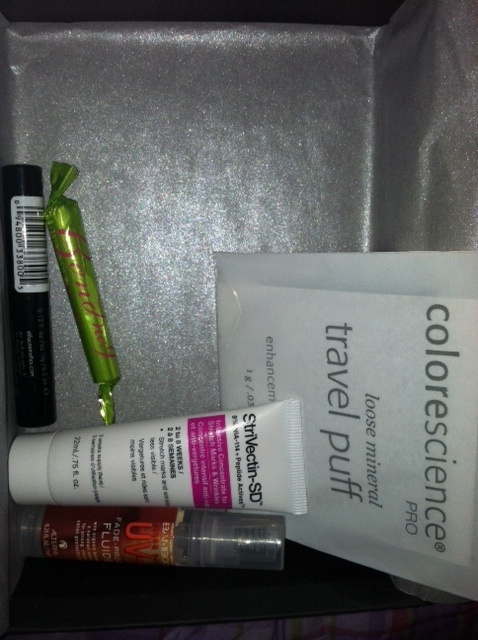 Because the colorscience was something I wanted to try, I am torn on whether my box was "worth it." When you consider that I then got everything else for $5, I guess it was. I think it is enough of a value for me to try it for one more month! Hopefully no more Stri-Vectin! I'm trying to decide whether to cancel my subscription, too. Looks like we each like different things - I love the Stri Vectin. The Bond no. 9 is great. I think the first 3 boxes were much better. Hoping that July has more skin care products. I thought about joining the sample society, but $15 seemed extreme for a box of samples. Allure use to send me samples for free, but they have ceased the free samples since they launched the beauty box program.